In the year that President Barack Obama was re-elected, Shrujana Niranjani Shridhar came across a story in The Hindu (January 21, 2013) about the Siddis celebrating the victory. The Siddis are people of African origin who have been living in India for centuries. “That was really how I found out about the Siddis,” says the Mumbai-based artist. 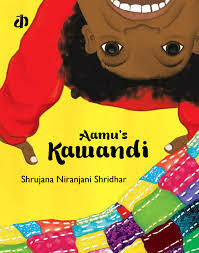 The result is Aamu’s Kawandi , written and illustrated by Shridhar and published by the Delhi-based Katha. The story is about a little Siddi girl, Aamu, who flits about the pages of the picture book, introducing the reader to her friends Chinni and Jojo, her family, and her community that lives in Mainalli in Karnataka. Aamu’s mother makes beautiful patchwork quilts called kawandi , and so the little girl decides to make one as well, but out of paper. “Siddi women traditionally make one big quilt, or even a baby quilt, out of scraps from everyone’s clothes. Aamu’s mother also makes quilts, and like most little girls, she’s very proud of her mother and imitates her, which is why she also makes a kawandi ,” says Shridhar. Shridhar says one of the aspects that she struggled with was explaining that most Siddis used to be bonded labour. “How do you explain that to a child?” she asks. “But I just had to subtly state that Aamu’s grandmother used to work on someone else’s land and that now her mother works for herself. A little boy who read the book identified that the grandmother might not have been treated very well, and was very curious about what ended up happening to her,” she recounts. When they went on their first recce, the book team met Obeng Pashington, a scholar in African diaspora studies who has worked with the Siddis for many years. It turned out to be an inspiring experience for Shridhar, but for her, most of the observations happened while sitting around sketching the village and its people casually, or through conversations with them. Of course, it wasn’t easy to translate all that she observed into a picture book. “After a couple of us went on-field for the first time, I was totally devastated,” says Shridhar. “I couldn’t connect anything I had read to what I had seen. Every time I’d come back home from a visit to Mainalli, I would be in a daze. I wanted to explore some very complex subjects like the identity of politics or gender segregation that I didn't have a total grasp on myself. But one day after I came back from a trip to Mainalli, I realised that if I had to present my culture to someone new, I’d do it from a place of pride, and that sense of pride set the tone for the story,” she adds.